We’re Very Serious about our Music! 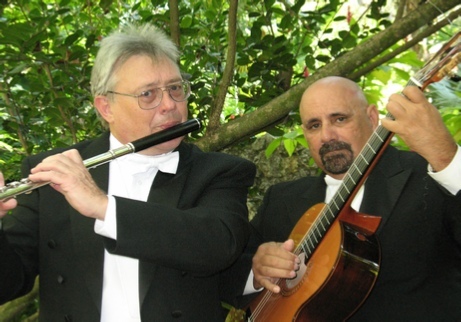 The Billington and Gonzalez Classical Flute and Guitar Duo, formed in the autumn of 1988, has performed extensively in the South Florida region. The repertoire of the Billington and Gonzalez Duo ranges from arrangements of medieval cantigas to original compositions of twentieth-century music for flute and guitar written specifically for the Duo. The Duo also specializes in the performance of works from the western hemisphere. 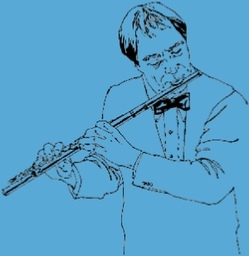 Canadian-born flutist Robert David Billington earned his BA from Northern Michigan University, his MM from Western Michigan University, and his DMA in flute performance from the University of Miami. Dr. Billington currently serves as principal flutist with the Miami Lyric Opera Orchestra and as baroque flutist with the Cameata del Re early music ensemble. Guitarist Rene Gonzalez received his BM, MM, and his DMA in guitar performance from the University of Miami where he is the director emeritus of the classical guitar program. Dr. Gonzalez teaches guitar master classes and performs recitals throughout the United States, Europe, and Latin America and has released the CD “The Hummingbird” on the EFM label. The Billington and Gonzalez Duo has performed concerts in San German, Puerto Rico at the Interamerican University, at Springfield, IL for the Springfield Classical Guitar Society; in Lake Wales, FL at the Historic Bok Sanctuary; in Jupiter, FL for the Hibel Museum Promenade Concert Series; in West Palm Beach, FL at the Norton Museum for the LIVE! at the Norton Concert Series; in Tavernier, FL for the Church of San Pedro Concert Series; in Weston, FL for La Cucina Tuscana Dinner Concerts; in Coconut Grove, FL for the Barnacle Historic Site Concerts Under the Moonlight Concert Series; in Hollywood, FL for the Hollywood Center for the Performing Arts Concert Series and for the City of Hollywood Noontime Concert Series; in Fort Lauderdale, FL for the Tea at Lily's Concerts; in Miami and Coral Springs, FL for Borders Books and Music Concerts; and has also performed concerts in Coral Gables and Miami, FL at the Deering Estate for Holiday Under the Stars, at the University of Miami Gusman Hall, the Biltmore Hotel, the Chapel of the Venerable Bede, Trinity Episcopal Cathedral, the Cuban Museum of Art and Culture, and at various branches of the Miami-Dade Public Library. The Billington and Gonzalez Duo has also appeared as a group or as part of a larger LGEM Ensemble at the Beaux Arts Festival, the Fairchild Tropical Botanical Garden Ramble, the Miami Beach Art Deco Festival, and at the Fort Lauderdale Downtown Festival of the Arts. For more information on the Billington and Gonzalez Duo, please e-mail Dr. Billington at rdbflute@lgem.com. You may also call Dr. Billington at 305-669-1754. Click here to download a high resolution .pdf print file of this information.